The Frozen Fleet is a frozen plain found southwest of Fharun Stronghold. A Breton fleet was broken along the shore, and the survivors have set up camp nearby. The surroundings of the shipwrecked fleet are sprawling with Riekr goblins and occasional Ice Wraiths. 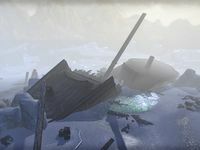 Three of the wrecked ships are named High Rock's Zeal, Materre's Fortune and Pride of Northpoint.